The HogHopper™ is highly target specific bait delivery device for feral pig control, based on a number of years of stringent non-toxic field testing. 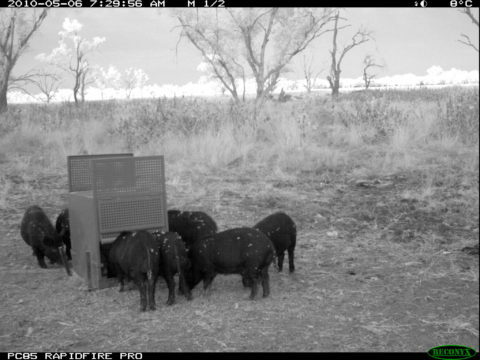 In addition, the final field efficacy trial demonstrated that the HogHopper™ could reduce feral pig populations by 90% to 100% whilst delivering toxic grain or PIGOUT® and it was able to prevent all non-target access. A product of this nature (that also reduces labour intensity and protects bait from weather) has the potential to be adopted by government land mangers and private land managers alike. HogHopper™ is designed to allow feral pigs to access poison baits in the station, and restrict other species (such as native species and livestock) from taking bait. The door of the device is easily raised by feral pigs allowing them to feed on bait, but it excludes non-target species that lack the physical attributes to lift the sliding door. Small rodents are also unable to access baits. The HogHopper™ device has been extensively field tested with outstanding results. The device has the added benefit of preventing bait from being exposed to rain and weather, thereby preventing bait degradation. The HogHopper™ will help to keep feral pig numbers at a minimum to reduce disease transmission should an outbreak occur. The HogHopper™ is a result of a number of years of research, development and commercialisation through a strategic research partnership to support its commercialisation and subsequent launch to market. Where can I purchase the delivery system?